In Kathmandu, we will explore Kathmandu Valley’s Cultural World Heritage Sites designated by UNESCO. These include ancient palaces and temples. Then we will embark on Everest Three Pass Traverse, which takes us along the traditional Everest trail to Chhukung Valley below Lhotse. 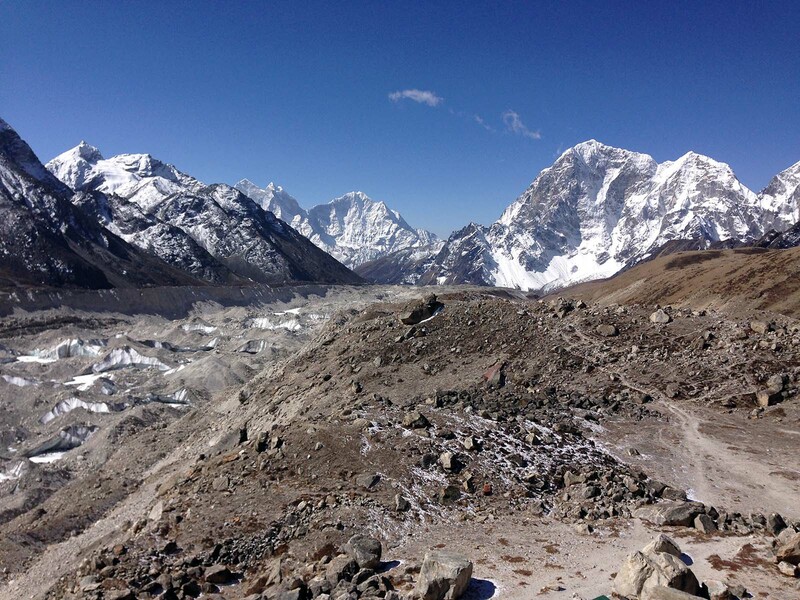 From here, we will hike through trails east to west below Nuptse crossing the Kongmala (pass) to Lobuche. Then we will hike to Kalapathar viewpoint to enjoy the majestic view of Everest, other sister peaks and the surrounding natural beauty. 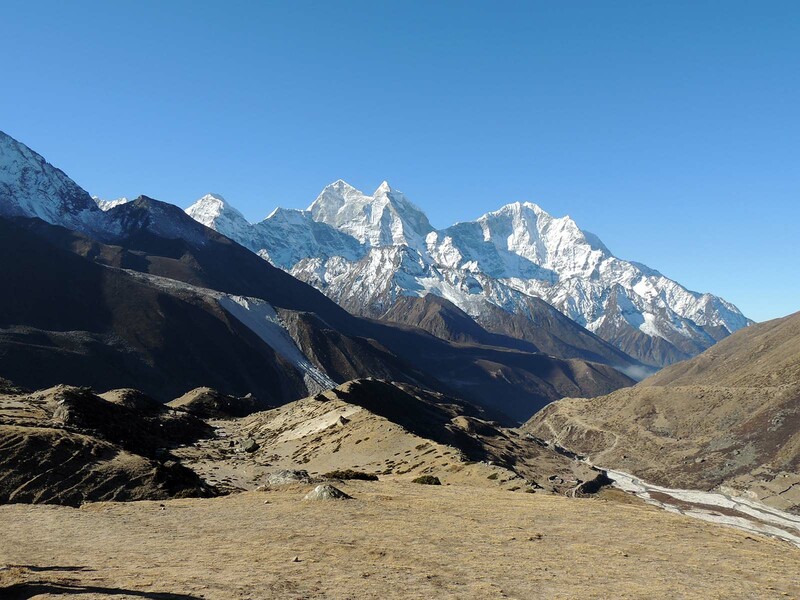 After enjoying the enchanting beauty of Everest Valley, we’ll hike down to Dzonglha from where we hike up Chola and across the Ngozumpa Glacier to Gokyo Lake below Mount Cho Oyu. From Gokyo Lake, we will hike over Renjola and come out to Thame village below Tashi Lapcha-Nangpala and then back to Namche. We will visit two major viewpoints such as Kalapathar and Gokyo Ri. 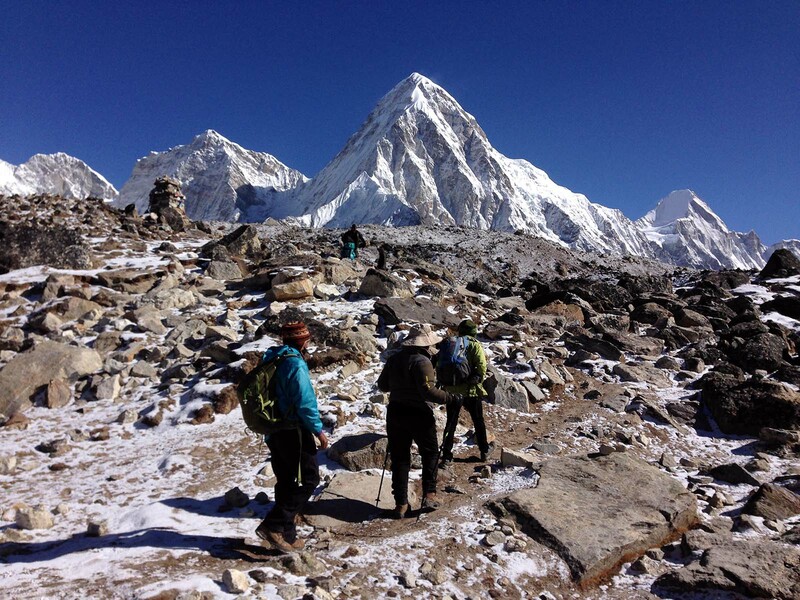 Stunning mountain views, scenery and Sherpa culture are the theme of this trek. 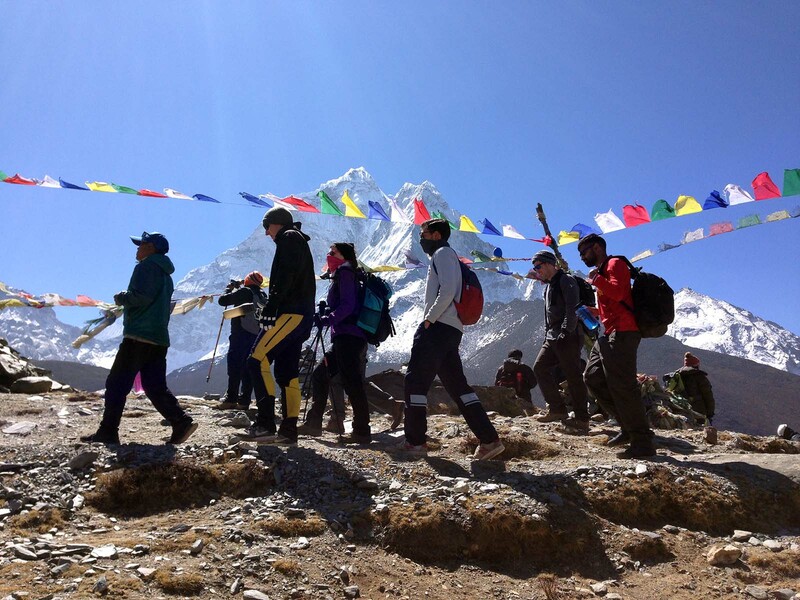 If you desire to hike the Everest region including the high-altitude pass trails, then join us. We will lead the way for you with careful planning so that you will have a safe and pleasant trip of a lifetime. This trek is suitable for experienced hikers seeking the ultimate experience in adventure hiking in nature that is rugged, steep, uneven and exposed terrains in the higher slopes of the mountains. However, crampons and ice axe are not required for this trek as this is not a climbing trip. Meet, be welcomed and transfer to hotel. If you arrive during the day, remainder of the day is free to relax to get over your jetlag. Overnight at hotel / 2 nights. Meet our trekking crew as we arrive, and then trek to Monjo through the scenic trail along the Dudh Koshi River. We will hike through mix of downhill, straight and uphill trails rest of the day. En route, we will see scenic view of mountains and forests, village settlements and farmlands. We will also meet local people carrying out their daily chores. Lunch will be served around mid-day along the trail at a local inn cafe. Dinner and breakfast served at the lodge we spend overnight. Breakfast and trek to Namche. 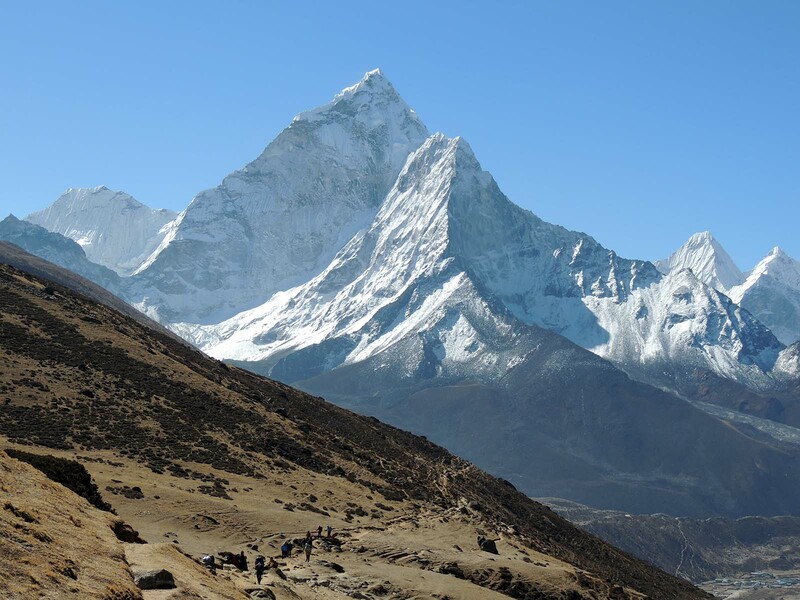 Today, we will enter the Sagarmatha National Park area, which is also Nature World Heritage Site declared by UNESCO. We will hike through mixed deciduous forest and alpine scrub. In the morning, it is an easy to moderate trail and then uphill until we reach our evening stop. Overnight in lodge / 2 nights. Lunch and dinner are served at our lodge. Breakfast and trek to Tengboche. Along the route, we may see Himalayan Tahr grazing on the slope. Also, we will see spectacular view of Mount Tawoche, Nuptse, Everest, Lhotse Shar, Ama Dablam, Kangtega, Thamserku, and Kwangde. 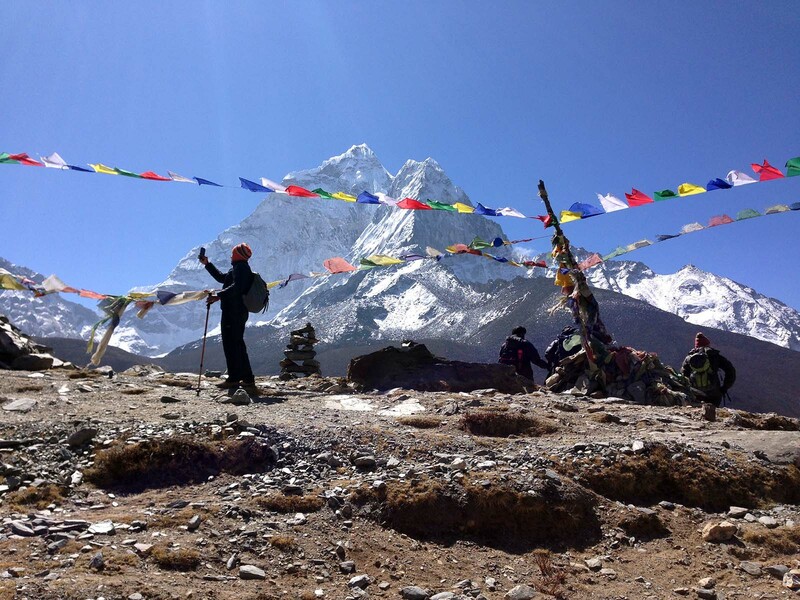 It is easy to moderate hike until lunch stop and then uphill in the afternoon to Tengboche. We will hike on a reasonably maintained trail. 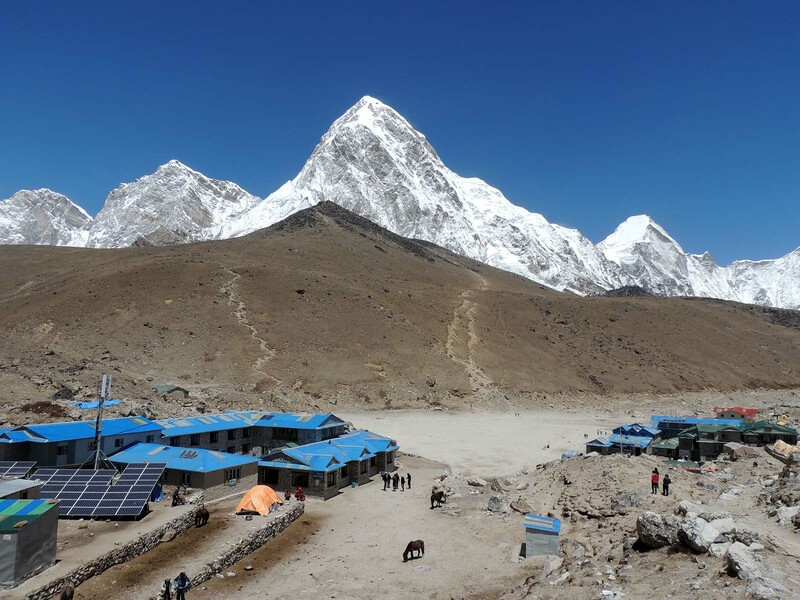 We will enjoy spectacular mountain views from Tengboche, visit the monastery and then hike through the alpine Rhododendron and Juniper forest, Deuche Nunnery, Pangboche village, farmlands and open pastures. It is a gradual uphill hike rest of the day though not difficult. The trail scenery and mountain views are excellent. While hiking the forested part of the trail, we may see Musk Deer and Blood Pheasants. We’ll hike along the Imjatse Khola (River) to Chhukung enjoying beautiful scenery and mountain views. It is a gradual uphill trek until we get to our evening stop. Today, we will either relax to acclimatize if we feel the need or hike to Chhukung Ri. 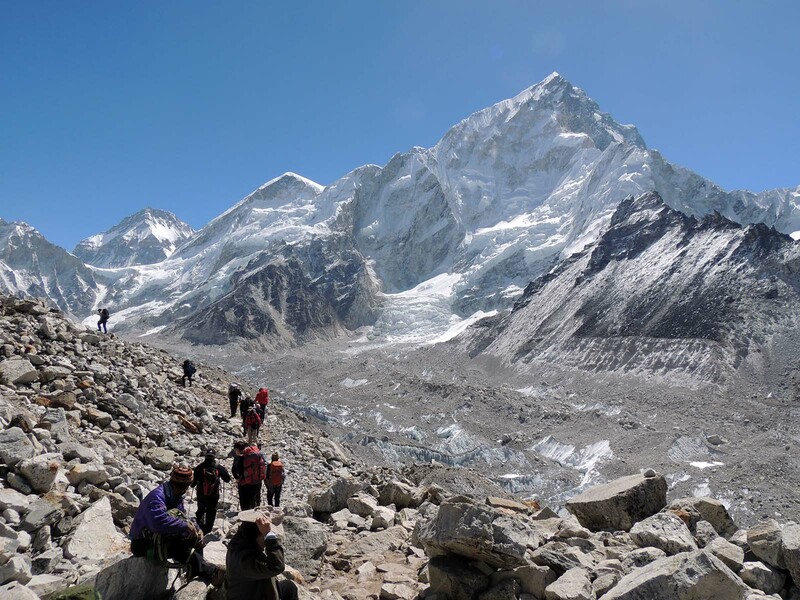 This is also a very attractive trek that you can see the whole Chhukung Valley which is directly below Mount Nuptse wall and Lhotse. From atop Chhukung Ri, you can see Nuptse, Lhotse Shar, Baruntse, Island peak, Ama Lapchha Pass area, Ama Dablam, Tawoche to Cholatse peak, Thamserku, Kangtega and numerous other peaks in the region. Early breakfast and hike to Chhukung Ri with pack lunch. It is mostly uphill hike to the viewpoint and then downhill hike back to Chhukung campsite. 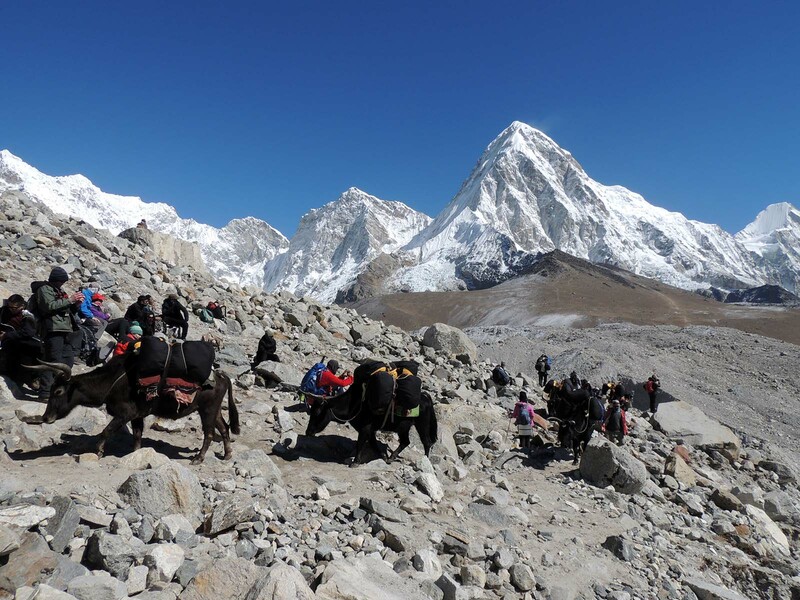 We will start early to Lobuche via Kongmala and then through the Khumbu Glacier moraine. We are hiking through a trail that is less travelled and unmaintained. 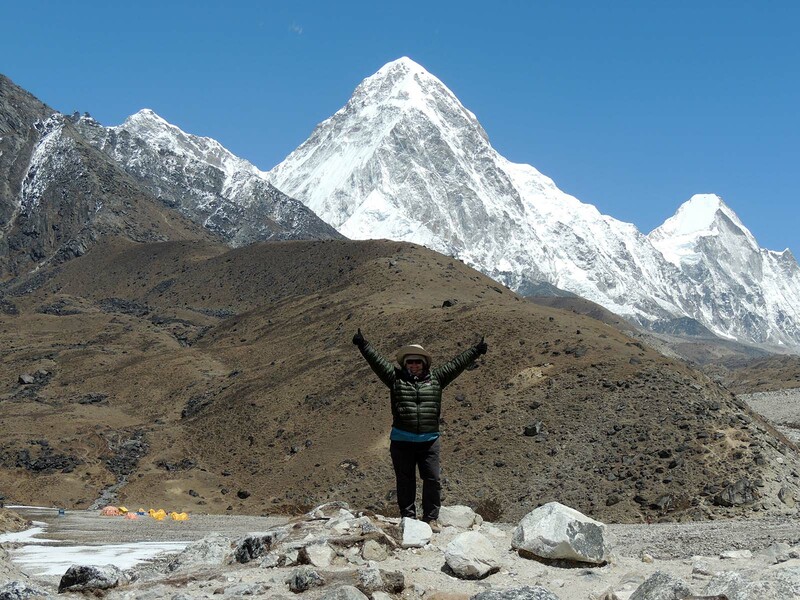 In the late afternoon, we will connect with famous Everest trail in Lobuche. Today is an easy downhill hike to Dzongla, a summer Yak and Nak pasture area with potato fields surrounded by great views. We will start early hike to Chola La to avoid any unwanted late afternoon weather at the pass. Today, we’ll hike through unmaintained trails and less travelled area. It is a steep uphill to the pass and then steep downhill until we reach the Westside of Chola Peak. 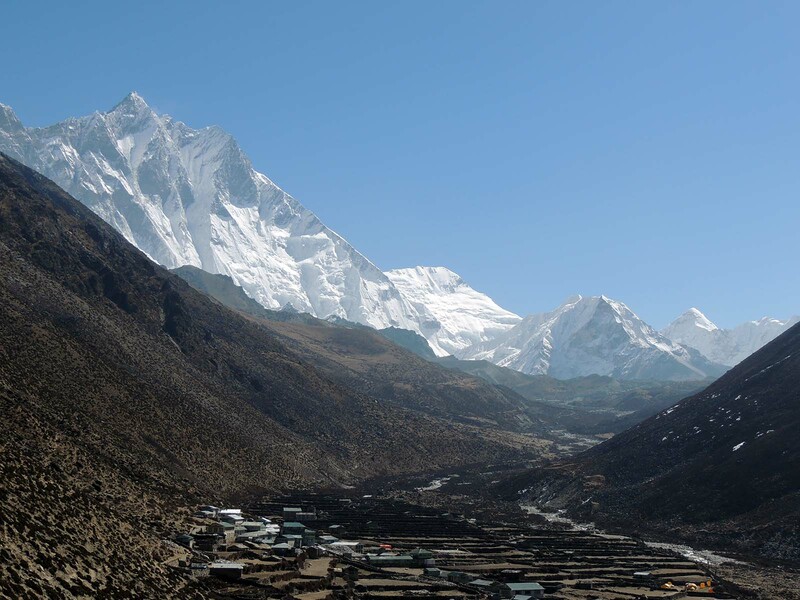 Clear day will give us stunningly beautiful views of Khumbu Valley and peaks. 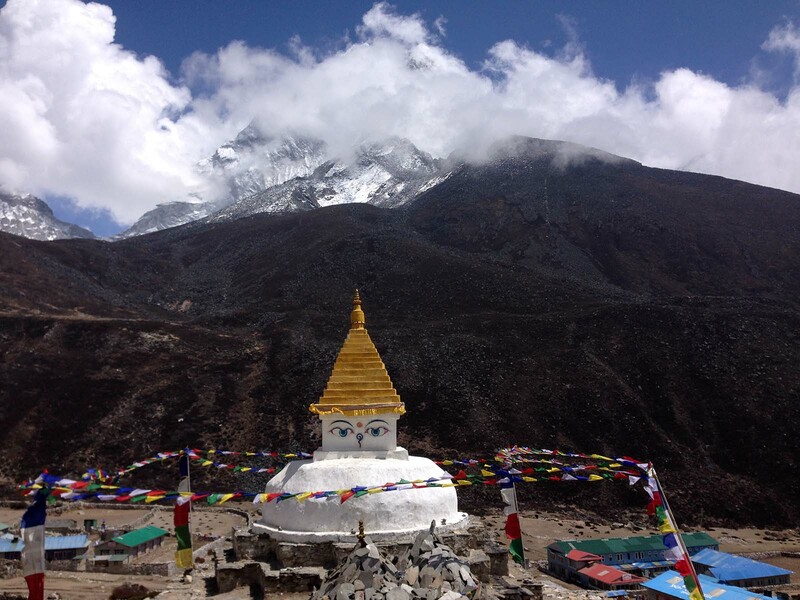 We will hike across the Ngozumpa Glacier to Gokyo Lake on the Westside and rest remainder of the day. Early morning-we’ll trek to Gokyo Ri for a stunningly beautiful panoramic view of the entire Khumbu Himalaya including Mount Everest, Lhotse Shar, Nuptse, Makalu, Cho-Oyu, Gyachung Kang, Gokyo valley and the massive Ngozumpa Glacier and beyond as far as your eyes can see. Remainder of the day is free to relax to recharge our energy. We will trek uphill to Renjo La and then downhill to our evening stop. The trail goes through rocky ancient glacier and summer pasture area. We will hike downhill to Thame through the scenic trail with spectacular mountain views. Thame, the last major village before going over the famous Nangpala (ancient trade route between Nepal and Tibet). Thame monastery is one of the oldest Buddhist temples in the region. Thame is also home of Tenzing, Apa and Lhakpa Sherpa, some of the renowned mountaineers of Nepal. We will pay a visit to Thame Monastery. The next two days-we will hike to Lukla via the same trail we hiked up. Morning flight to Kathmandu and remainder of the day at leisure. Evening-Nepali farewell dinner will be served. Overnight at hotel/1 night. Breakfast served at hotel and then our complimentary transfer will take you to Kathmandu Airport for your connecting flight. Our service ends after we transfer to the airport.